Rhea’s mother finds her daughter having severe mood swings. She feels it is a common teenage crisis. Sometimes she finds her daughter too excited and happy that seems more than normal for reasons that do not balance her actions. Sometimes her daughter seems to be so depressed and sad that it seems sky has fallen over her head and there is no escape from her preconceived misery. Her friends find it hard to pace up with her extreme swings. This situation continued until one day her aunt came to visit her and could understand that the child needs help and might be undergoing bipolar disorder. Does your child have extreme mood swings? If yes, how many times have you seen such extreme behavior in a week or in a day? Do you see her getting excited more than normal for her age group at a given situation? Is she moody more often? If the answer is yes then it is a good idea to get a medical opinion and discuss with a doctor. This is because what seems to be normal mood swings may also turn out to be a serious disorder in the brain known as bipolar disorder. Bipolar disorder is also known as a manic disorder is a serious mental disorder of an individual wherein a person experiences extreme mood swings that are more than normal. Sometimes he or she might feel extremely excited and happy known as a manic episode when they get more excited than other children of the same age group for a given situation. At times they might exhibit a severe depressive behavior known as the depressive episode when they feel extremely low and down with sadness and depression. How is Bipolar disorder different from normal mood swings? 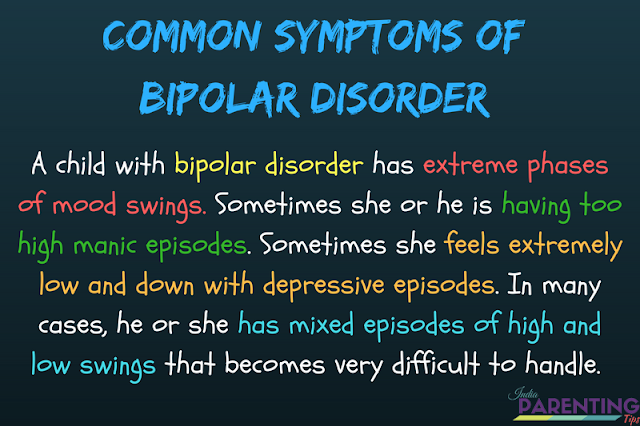 Bipolar disorder is more than normal mood swings in terms of severity, frequency, and dangerous consequences. A child with bipolar disorder experiences extreme mood swings that are very powerful and strong to handle without therapy and medication. It becomes very difficult to handle the extreme swings which are very steep and random. The frequency of such mood swings from manic to depressive varies from case to case child to child. Bipolar disorder is a series of mental illness which has extreme consequences leading to suicidal thoughts and attempts. Therefore it is very important for us to identify the symptoms and take appropriate actions as soon as possible. It might last for the lifetime as well. What are the common symptoms of Bipolar disorder? 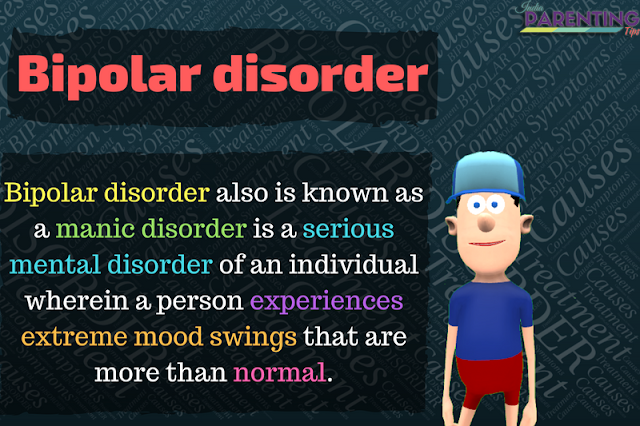 A child with bipolar disorder has extreme phases of mood swings. Sometimes she or he is having too high manic episodes. Sometimes she feels extremely low and down with depressive episodes. In many cases, he or she has mixed episodes of high and low swings that becomes very difficult to handle. These various mood swings often last for a week or two or even more. In most cases, a particular symptom lasts for an entire day. Exhibits behavior of extreme happiness and silly attitudes which is more than normal for a particular age group. When he or she has a sleeping disorder and does not feel tired when actually he or she should need rest or sleep. When he or she gets angry very easily and frequently. When he or she has difficulty to stay focussed and remain attentive. When he or she tries to talk fast so many things at one time as if there is no time enough to talk. When they try doing some risky things that may not be safe for them nor could be termed as adventurous for his or her age group. Unusual social behaviors. When you see the sudden usual social behavior of the child when interacting with family members, relatives, and guests. Like laughing out loud more than usual, extremely friendly that is not usual for him or her, talking excessively and more than needed and so on. When he or she gets extremely sad and depressed for simple reasons. When you see a sudden change in sleeping habits like sleeping more than normal sleeping hours or not sleeping the minimum sleeping time. When you see the child with an attitude of low self-esteem and feeling worthless and guilty. When he or she eats either too little or eats too much also known as stress eating. When the child shows no interest in any physical fun activity. In extreme cases, the child talks about death, loss of life and hurting himself or herself. 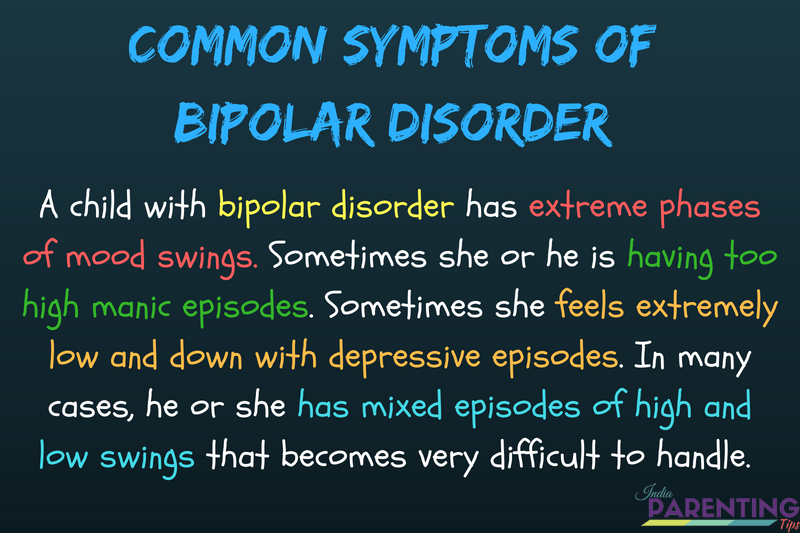 It is difficult to identify a particular cause for bipolar disorder. Sometimes it could be a genetic disorder when it is related to bloodline and family history. However, we cannot generalize this opinion that if one person in the family has a bipolar disorder then his future generation would definitely have a similar disorder. Another factor might be problems in the brain structure or in the function which varies from case to case and person to person. There is an ongoing research on causes for bipolar disorders for adults and children by scientists and we are yet to arrive at a particular conclusion. What we can say that there could be several factors and causes that could be a reason for such a brain disorder. How can we treat children with bipolar disorder? Medication - In the case of medication children are treated with the help of medicines. Since children respond to medicines differently and it varies from child to child as the doctors prescribe the medicine depending on the particular case. One good tip for this is to identify the symptoms fast and go slow with the entire process. Do not expect changes overnight. Things take time to settle down and you got to be patient. Also please make sure that you take any decision with consultation with a doctor and remember to discuss any side effects if you identify one. Therapy - The other treatment for bipolar disorder is therapy. There could be talking sessions or psychotherapies with the child, one to one or could be series of activity sessions with the child to understand and evaluate the current stage of the disorder and devise ‘action plans’ accordingly. Sometimes certain therapies include support from family members as well as schools. What can we expect from treatments? With proper treatment at a proper time, one can expect positive changes over the period. Patience and perseverance is the rule. Do not expect anything overnight. That may not be good for your child as well. Ensure regular check-up and monitor your child’s behaviors and milestones regularly. There are times that bipolar behavior of your child might change. In such cases, the treatment also changes accordingly. Sometimes symptoms might reoccur or come back. Holding on and sticking to the treatment with constant monitoring is the key to get positive outcomes. You can definitely bring some changes and help your child to come out of the bipolar disorder if you work closely with the doctor and therapist. Any help begins with identifying the issue known as a diagnosis. If you notice any behavioral changes you should immediately consult with your doctor. That’s the first step. Once you are able to diagnose the problem you can get the treatment started at the earliest. The earlier you start the earlier the process of healing would begin. However remember what I always say, patience is the key. Do not lose your hope and temper. Give your child and yourself, time. Regular and genuine encouragement to the child. Talk with your child and discuss with him that everything is okay. Be his cushion and backbone to support him and give him the warmth of your affection. Bipolar disorder of a child is something that is difficult to identify. It is most commonly confused with attention deficit hyperactivity disorder (ADHD) as the symptoms are quite similar yet different. Another problem is that there is no particular treatment for the children having bipolar disorder as this is most commonly found amongst teens and young adults. Further, the frequency of mood changes in changes is often found very quickly. It can be within a day that a child might experience different mood swings. Thus as a parent, we need to be extremely alert and vigilant to identify the symptoms and act promptly. Follow regular check-ups and schedules with the doctor and therapist. Monitor side effects like a regular blood test, weight check-up and so on. Take help from friends and family. Talk to school teachers and discuss with the issue to work out plan and help the child. That is the key to success in dealing with bipolar disorder of children. Read about ADHD, AUTISM, ANEMIA, DYSLEXIA, etc. I hope my suggestions are helpful. Do share your thoughts as feedback.